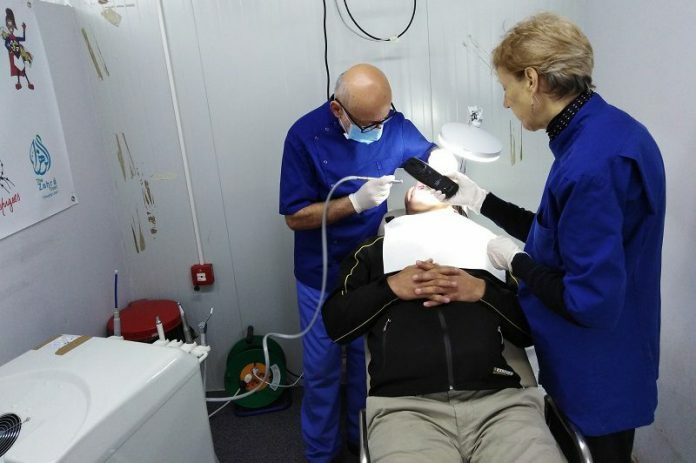 Last week I reported on my seventh trip from Rye to provide emergency dental treatment for refugees in Greece, and this week I look at some individual cases. As on each previous visit I finished each day with a mixture of satisfaction and frustration. Those who had a relatively straightforward need such as a filling, basic extraction or oral health advice could be helped and sent on their way better than they had been. This applies to some patients and is part of the reason that I keep on returning to do this work because I know that I have been able to make an appreciable difference and helped those in need. However, one cannot help but dwell on the patients who cannot be helped in the clinic because there is insufficient equipment, an x-ray machine being the most obvious example, and no referral pathway for complex cases. For whatever reason, perhaps fear or perhaps previous lack of access to dental care, many patients had waited until their condition was advanced before consulting a dentist which made them more difficult to treat. There are some patients that stand out from the rest. On a couple of occasions patients came in complaining of pain but pleasingly and unusually they had excellent dentition and no obvious reason for the pain. An x-ray, if available, might have provided a solution but I considered it equally likely that their dental pain was a reflection of the trauma they had suffered and the stress they were experiencing. On the other hand, an obviously psychologically disturbed man had been triaged by the coordinator and translator and was considered to be imagining his dental pain but I was asked to see him anyway. On examination I found a cavity which could be filled thus providing a solution to at least one of his problems. One lady was in severe pain and asked for an extraction. She was going to Athens later that day as she needed an operation so it was not ideal to extract a tooth in such circumstances but the pain she was experiencing and the uncertainty as to when she would have further access to a dentist made me agree to her request and fortunately the extraction was straightforward. The lady was a French speaker, Diana and I were able to communicate with her sufficiently which was just as well as there were no French speakers among the translators working with us. There were quite a few unaccompanied minors that were brought to me, all of them young men aged 15 to 17. Every one had major dental problems which would require many visits to the clinic to sort out. I could only do a certain amount of treatment per patient mindful of the fact that there was a limited amount of time available and a long queue of people to see. I saw very few young children but those I did see had multiple decayed teeth. One little lad aged three marched in bravely and announced (via the translator) that he wanted his tooth out. I was impressed by his sangfroid but, alas, this did not survive the first contact with reality as he would not let me look at his teeth despite repeated exhortations from the translator and his parents, I don’t know what they were saying to him but whatever it was only seemed to make him worse. He’d been promised a present, a beach ball, if he cooperated but we sent him away with it anyway so as not to make a visit to the dentist something associated with punishment (depriving him of his gift) and at least he left smiling. One morning two consecutive patients, both young men, were on the point of fainting – one after a difficult extraction and one before his extraction – so I had to lower the head rest on the chair and hold their legs in the air to improve the blood flow to the brain. Both revived and no-one else fainted while I was at Moria. As on previous trips I found that many patients refused to have extractions despite my opinion that it was the best treatment for them. They opted instead for the first part of a root treatment. This in itself is only a short term measure which has to be followed up by part two but the clinic lacks the equipment for this. Although this was fully explained, the hope that the treatment would somehow and somewhere be completed prevailed and an extraction would be refused. 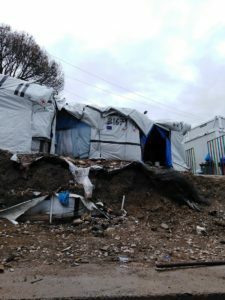 Next week Kyriacos reports on life of a refugee.